Add dressing and stir to coat. To roast sweet potatoes, lightly coat cubed potatoes in olive oil and sprinkle with salt and pepper. Roast in a 400 degree F oven until soft. Turn several times. 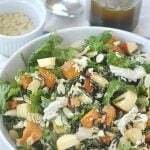 Harvest Bowl Salad was originally written by Leigh Anne Wilkes at https://www.yourhomebasedmom.com/harvest-bowl-salad/.